This is the Traxxas Slash Pro 2WD 1/10 Scale Short-Course Ready-to-Race Truck with the TQ 2.4GHz radio system with the ROCK-N-ROLL body color scheme shown in the first image. This truck comes fully assembled and Ready-To-Race, with the Traxxas TQ 2.4GHz radio system, XL-5 Waterproof Electronic Speed Control, ProGraphix painted body. Just add AA batteries, a 7-cell 8.4 volt battery pack and battery charger, and you are Ready-to-Race! The Slash is built Traxxas Tough to keep you off the workbench and deep in the fun zone. Plus, it’s upgradeable with a full line of Traxxas factory parts and accessories for custom performance and personalization. Pro 2 driving and handling experience as closely as possible. The scale appearing tires provide just the right amount of bite and thick, blinding clouds of dirt roost. The patent pending Revo-spec Torque-Control slipper clutch design delivers smooth operation, precise adjustment, and consistent traction control. The bellcrank steering system virtually eliminates bump steer for precise handling and control. A digital steering servo delivers lightning fast response. Traxxas shocked enthusiasts with the release of our exclusive watertight, sealed electronics in the E-Maxx that provided the freedom to drive where you want to drive through water, mud, snow, and other wet-running conditions that wouldn't have been possible before. Now the Traxxas Slash is only the second Ready-To-Race model ever to come equipped with this brand new technology. The new XL-5 electronic speed control and the mini receiver are sealed against the elements giving you the freedom go places you might not have thought possible. It opens up a whole new world of adventure and fun. Wet muddy tracks are no problem for the Slash. The battery compartment makes it easy to install batteries and the clever design makes it quickly adaptable for either 6 or 7-cell running (hump packs or stick packs). The Titan 12T 550 modified motor is designed for incredible mod-motor power output with virtually maintenance-free operation, and long-lasting performance. The Titan 12T 550 motor's integrated cooling fan pulls cool air through the motor to keep temperatures down. Airflow is routed through vent tunnels molded in the motor plate. A cooler running motor equates to faster speeds, longer runtime, and extended motor life. The XL-5 Electronic Speed Control offers high current handling, EZ-Set one-button setup, and smooth high-frequency control. Three drive profiles, thermal shutdown protection, gold-plated connectors, and incredibly low resistance are all features you might expect to only be available on an expensive replacement ESC. As today's batteries store more and more energy inside their cells, traditional battery connectors could no longer keep up. The included Traxxas High-Current Connector opens the door for unrestricted current flow. The Traxxas Slash is built for extreme Velineon brushless horsepower (sold separately). Simply bolt it in and 7-cell speed jumps to 40+mph. Add 11.1V LiPo batteries and you have the potential to double your speed. Bigger roosts and longer hang-time are right at your fingertips. The included steel transmission gears, full ball bearings, and high-quality metal turnbuckle links are the winning setup for brushless durability. The factory-installed planetary differential is Traxxas-tough with hardened steel gears that never need adjusting! Perfect for long-lasting, all-day fun. Accessory battery hold downs are available for use with large capacity Lipo battery packs* that can extend speed and run time. Compare the durability and features to others and you'll see that only Traxxas makes them truly brushless ready. 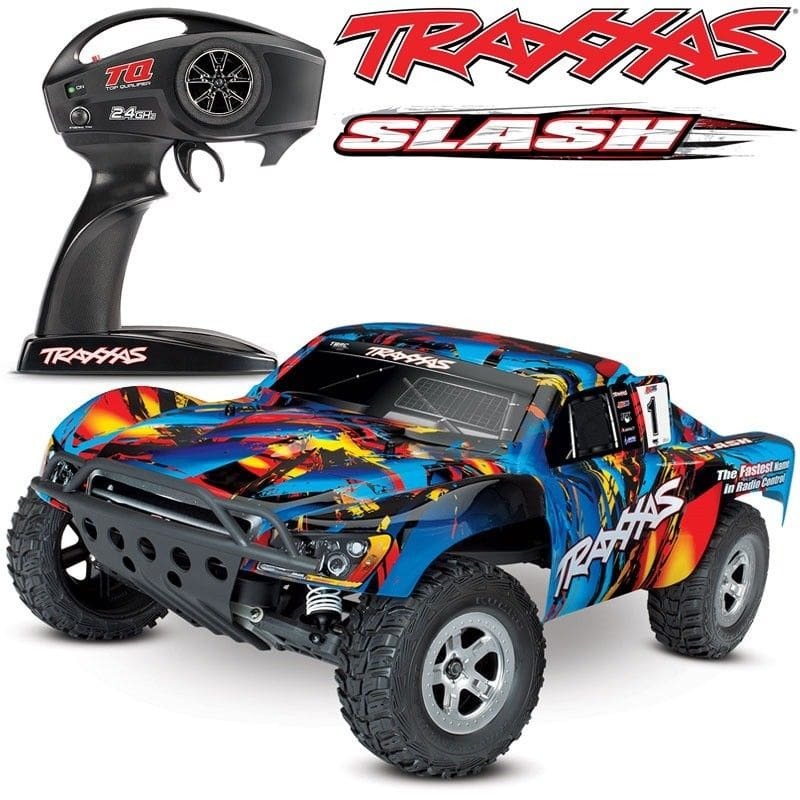 The Traxxas Slash model 5802 comes fully-assembled and Ready-To-Race with the TQ 2.4GHz radio system installed and adjusted, XL-5 power system, a painted and decaled body, pre-glued tires, and detailed instructions. Traxxas backs the Slash and all of our products with top-notch support that is second to none. A staff of skilled representatives is on-hand to answer your questions via phone, website, or e-mail. Unmatched parts support allows the Slash to be serviced with parts and support from thousands of hobby dealers worldwide. Your investment is also protected by the Traxxas Lifetime Electronics Warranty. Traxxas goes the extra mile to ensure that your R/C experience is easy and fun (and fast! ).